As you may have read, these past weeks Maryanne Norton and I have been digging up history on today’s Shel/Don Building, whose upper level was leased as the Duluth Municipal Court for 20 years beginning in 1909. Looking into the courtroom portion of this building’s history made us realize we had omitted an important public building in our book, Lost Duluth: the 1883 St. Louis County Courthouse that stood at 611 East Second Street. The first St. Louis County Courthouse was wherever the Honorable John Carey was living after he became judge of probate in 1859, which at first was his home in Oneota Township. In 1865 it moved with Carey to Robert Jefferson’s former home at 430 Lake Avenue South. Similarly, Duluth’s city government and police were operated from rented rooms above a Superior Street saloon—and would until 1889. That “remarkable shack,” like so many other important buildings in Duluth built in the early 1880s, was designed by St Paul architect George Wirth (and arguably the most unremarkable building he designed for the Zenith City). Carpenter Oliver Traphagen oversaw the building’s construction. Work on the two-story began on August 26, 1883, and was complete by January 1884. 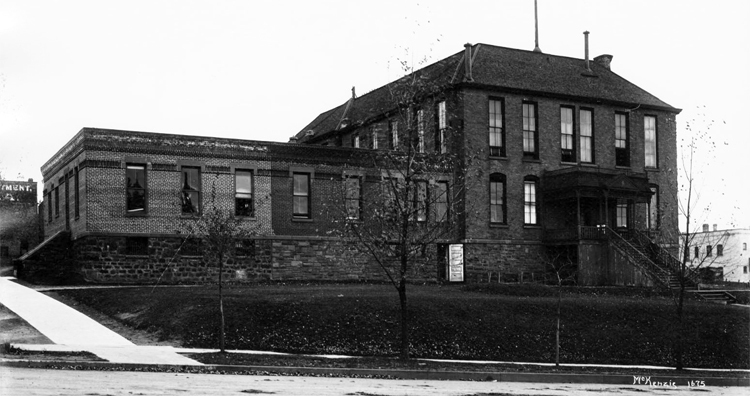 Some citizens had hoped for a building that would make a statement, and an editorial in the Duluth Weekly Tribune called for the courthouse to be faced with locally quarried brownstone, which the paper felt was not being used nearly enough in Duluth. The paper argued that it would give Duluthians “a courthouse…that the Zenith City can point to with pride for years to come.” What they got instead was a wood-frame building with an unremarkable brick façade. The county wasn’t planning on using it for long. On July 7, 1883, the Duluth Daily News called it a “temporary courthouse, nothing especially imposing or handsome.” But the newspaper didn’t think it was going to be as temporary as the county did, adding that “the worst thing about it is that it will probably be the only courthouse the county will have for many years.” It was right. The Temple idea never came to fruition, and the county—along with the city—turned its attention to a new idea: a Civic Center based on the City Beautiful movement championed by renowned architect Daniel Burnham that would include a city hall, a federal building and post office, a county jail, and—first things first—a county courthouse worthy of being called a county courthouse. The new courthouse was complete in autumn of 1909, and county officials who worked in the old building began moving out on October 30. On the 31st, the clerk of courts issued the last marriage license registered in the building to Charles Magnuson and Edna Gustafson. Those “old associations” include the memories of two hangings. In November 1884, John Waisensen and John Norland—both Finnish immigrants—were accused of the brutal murder of Joseph Farley. Norland hung himself with a blanket in his cell on April 9, 1885. Waisenen was convicted and hanged on the courthouse grounds on August 28, 1885; it was the first hanging in Minnesota in seventeen years. A scaffold was set up outside the courthouse. Seventy-five people were given tickets that allowed them a close view of the hanging; the rest, kept at 100 yards away by the police, craned their necks or climbed telegraph poles to get a better view. Sheriff McQuaid pulled the trap 3:02 in the afternoon; Waisensen dropped and his neck broke. The sheriff left him to dangle 20 minutes before cutting the rope. Several attending doctors then confirmed he was dead. The rope was cut into lengths of one-and-a-half inches and distributed as souvenirs; one viewer went home with the hat Waisensen was wearing before the sheriff removed it so he could cover the condemned man’s head with a hood. In 1903, Charles Henderson became the last man legally hanged in St. Louis County. He had been found guilty of killing his girlfriend, Ida McCormick, by stabbing her ten times with a knife. Sheriff William W. Butchart ordered a scaffold erected between the courthouse and county jail, built adjacent to the courthouse in 1889 and designed by Oliver Traphagen, who had helped build the “Wart House.” It was essentially the same site of the 1885 hanging, but the scaffolding was not built there. Instead, the hanging took place the courthouse’s Courtroom No. 1. Perhaps the Sheriff was trying to avoid the event turning into the circus the 1885 hanging had become. The 1883 courthouse did not stand for long after it was vacated. Bids for its demolition were called for by May 1910, and in 1911 the newspaper began reporting of baseball and football games taking place on “the old courthouse grounds.” In 1914 Mayor Prince began championing the location as the site for a farmers‘ market. The idea took hold, and by 1917 two one-story frame buildings stood on the property, identified on maps as “city market.” Today the site hosts St. Luke’s Hospital’s Hillside Center.